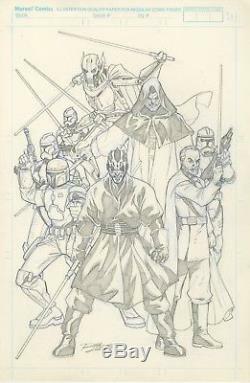 You are purchasing: STAR WARS PREQUELS SITH UNPUBLISHED COVER Original Art 11x17 by RON LIM 2005. This item is ORIGINAL ARTWORK - NOT A PRINT. LIM, the Classic Artist Draws an unpublished cover featuring some the PREQUELS greatest villains: EMPEROR PALPATINE, GENERAL GRIEVOUS, COUT DOOKU, DARTH MAUL, JANGO FETT, & SEVERAL CLONE TROOPERS. Signed by RON LIM on the bottom right border area. LOOK AT THE PENCIL DETAIL ON THIS PIECE - IT'S ABSOLUTELY AMAZING! Can you imaging what it would look like if you got it inked? Everything is original art - NO stats at all. Great piece of artwork done in pencil on OFFICIAL MARVEL COMICS STOCK comic art board which measures roughly 11" x 17.25 ". I WILL GLADLY COMPLY AND ANSWER. Nice intact fairly clean piece of artwork. If you have a specific question please ask me and I will gladly answer you. You will receive the item(s) shown in the scan(s). The item "STAR WARS PREQUELS SITH UNPUBLISHED COVER Original Art 11x17 by RON LIM 2005" is in sale since Friday, June 8, 2018. This item is in the category "Collectibles\Comics\Original Comic Art\Covers". The seller is "countorlokcollectibles2003" and is located in Springfield, Oregon. This item can be shipped worldwide.